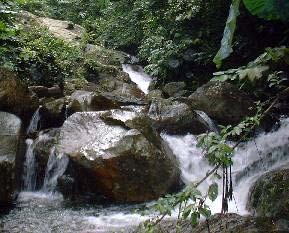 The way to this waterfall is termed as climbing the "Dolly Parton " hills. There is one part where the trial passes through 2 visible steep hillocks one after another. This time when we were there, the terrain had altered. Some one had cleverly made a long loop around these 2 small hills. 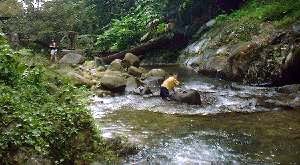 The place is in Ulu Langat, in fact you could see this river with the same name crossing the main road some distance before reaching Pangsoon. At one of the left turn off, a 3 kilometers paved road leads picnickers to the river banks, rapids and picnic sites at a undisturbed countryside. Some locals knows the place. At a clearing, after continuing some distance on a broken track, there is a shaded improvised car park. The trek starts, gradual slope and shaded for over 6 kilometers unabated. Some where at mid-journey, there is re-assuring sign of the water pipe leading down to Pangsoon Pump house. From there on it is following, weaving in and out of clearing to keep track of this ascending pipe. The jungle here is so pristine, no cultivation nor rubbish to lead the way. Instead giant millipedes of 3 species, black lilies, ferns and red berries dotted the trail. It was so rewarding for us that day! When the ascending stop, it is sign that we are almost there. Trekking along a level ridge, we could see the deep gorge down below. An "Orang Asli" house stands at the end of the gorge. This is a picture of a basin for a dried up waterfalls. This must have been a very beautiful and most spectacular waterfall. If only the picture is clear, this narrow chasm carved out of the stone cliff allows water to fall vertically for over 60 meters. In that place, we could see the small river below, what a sight. The top edge of the ex-waterfall is fitted with a shallow dam to direct water into a pipe. This sight sent a horrible thought that in future beautiful waterfall in Klau will suffer the same fate! They are talking of channeling water from Klau Pahang and piped them into Selangor. Here, the Lepok river is seen in its natural state. Broad, clean and clear water. The local resident is washing his laundry on the boulder. At the start of this rapids, is this series of cascades.. No visible waterfalls but the water drops some 15 meters over a distance of 100 meters. The ravine here is narrow and it not possible to climb up those huge slippery boulders to get on top of the cascades. However on the right banks, the thick vegetations did support a narrow trail to pass these boulders and behold the sight ahead after that thin partition. This is indeed a real waterfall from a postcard. Good foreground and backdrop for a photograph. A close up view of that main waterfall. This is the 2nd waterfall of this series. 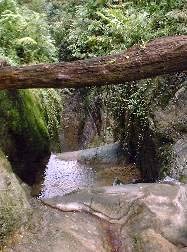 There is an upper waterfall that is separated into 2 flows. I could manage my way up over the first cascade. Moreover the ledge after the main fall shelters some of the of the view of that waterfall on top to prevent a descriptive picture. 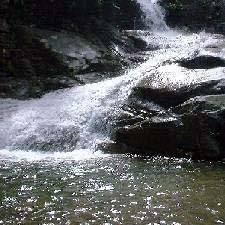 At the base of the main waterfall, the low drop did not built up enough energy to carve a pool in the hard rocky floor. The whole column of water than slide down a gentle cascade into a broad fair depth pool. 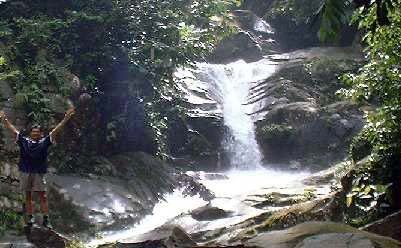 By virtue of the difficulties involved in accessing the area, the whole surrounding is one of the most pleasant and undisturbed waterfall spots we have seen for long time. 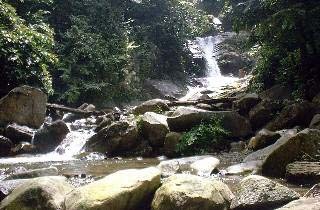 Enjoy the great natural wonders that Malaysia preserves.